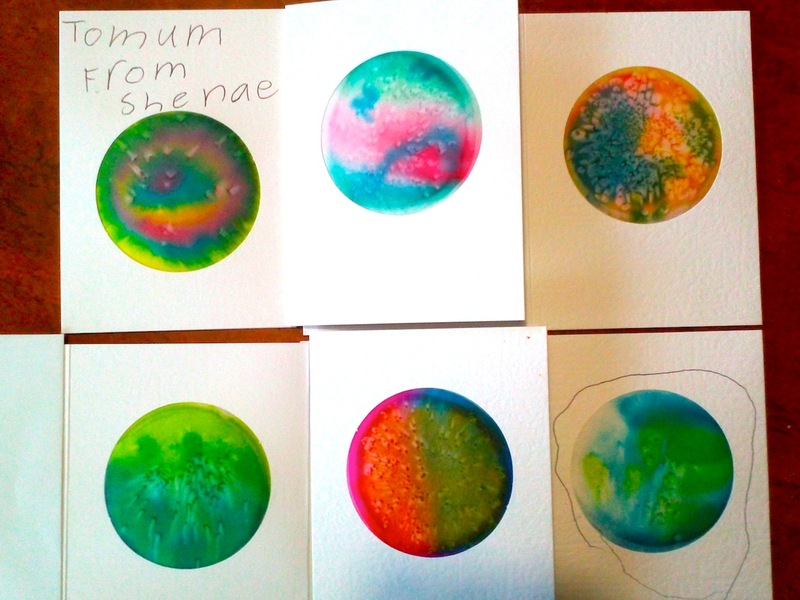 These colourful cards contain silk paintings using the salt technique, done at a small workshop at Eastern Shore Community House, East Devonport, Tasmania today. Lovely people… all co-operative, so involved, very polite …. just loved it. I think it is nice for everyone to go home with a finished product and, as we made badges last time, this time we put the paintings into cards. Most of the children give them to their parents. I just love that parents are so special to them. They are nearly always the first people the youngsters think of when sharing something special. And wouldn’t any parent feel special receiving any of these? Thank you to ESCH for asking me to tutor this session and thank you to TRA for funding this successful project……..Children for a Creative Future. This entry was posted in Silk painting, workshops, workshops art and tagged art play, children's art workshop, childrens art, colourful silk, community art workshop, creating with children, Devonport, Eastern Shore Community House, kids art, Kids for a creative future, salt technique on silk, short workshops, silk cards, silk painting, working with children.